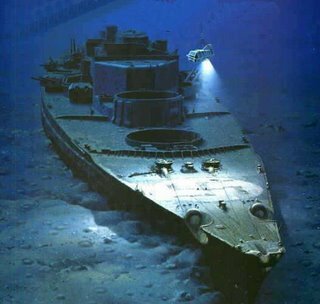 As the first post on our series “Famous Ships that Sank”, we’re covering the famed German Battleship Bismarck. 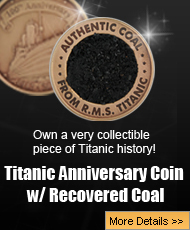 The shipwreck was discovered by none other than Robert Ballard (who also discover the Titanic) in 1989 about 3 miles below the surface of the Atlantic. Construction of the ship started in July 1936 and the ship made its debut launch in February 1939. The launch ceremony was attended by a grand-daughter of Otto von Bismarck himself, and none other than Adolf Hitler gave the christening speech. The Bismarck displaced 50,300 tons fully loaded and was 824 feet long. The battleship was by far Germany’s largest, with a crew of slightly over 2,000 men. The ship’s primary armaments were 4 super-turrets (2 aft, 2 forward)—each turret consisting of 2 monster 38cm guns. These turrets would be destined to inflict lethal damage on the famed British battleship HMS Hood during the Battle of the Denmark Strait. While the Titanic was built to be unsinkable by icebergs and similar collisions, the Bismarck was built with so much heavy armor as to be “unsinkable” by artillery fire. With such a monster battleship at Germany’s disposal, you would have expected it to be used to sink key elements of the British warship fleet. Such was not the case. The German Naval High Command (OKM) had adopted a strategy of using their biggest ships to raid Allied merchant ships in the Atlantic. The Bismarck contained a prize crew of 80, which is a second crew of men designed to take over the operations of a captured ship. This seems to me to be very akin to piracy! The Bismarck departed for its mission on May 19, 1941 and was joined by the heavy cruiser Prinz Eugen. The ships made their way for the Denmark Strait, in an attempt to make it into the open Atlantic, where they could wreak havoc on allied commercial shipping lanes. battleship HMS Prince of Wales. There ensued a fierce battle between the 2 groups of ships, with the Bismark inflicting lethal damage on the HMS Hood. A 38cm armor piercing shell from the Bismarck penetrated the Hood’s deck and ignited ammunition storage depots (more than 100 tons of cordite high explosive!). The massive explosion broke the ship in half, and caused the ship to sink in under 8 minutes. Of her crew of 1,419 men, only 3 survived. The Prince of Wales had fared somewhat better, and managed to score a critical hit against the heavily armored Bismarck. This key hit struck above the waterline, but low enough that waves could now enter the Bismarck. The HMS Prince of Wales was ultimately forced to retreat, but had inflicted meaningful damage (and in the process itself had been quite damaged). The British citizenry were deeply impacted by the sinking of the HMS Hood, and Winston Churchill issued the famous statement, “sink the Bismarck”. The Royal Navy turned all of its efforts to finding and sinking the ship. With the Bismarck damaged, taking on water and leaking fuel, her captain, Lutjens, made the decision to head for occupied France (the port of St. Nazaire) to make repairs. However, with the British Navy on high alert and in full pursuit, this would be no easy feat. On May 26, an aircraft piloted by Leonard Smith of the US Navy spotted the elusive Bismarck. 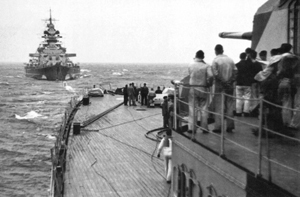 The only British asset that could reach the Bismarck in time to prevent it from escaping to occupied France was the HMS Ark Royal (a light aircraft carrier) with Force H. Force H was led by the legendary Admiral James Somerville, who himself had served on the HSM Hood, so the opportunity to sink the Bismarck must have had special meaning to him. The Ark Royal launched its torpedo bombers, interestingly named Fairey Swordfish (not the toughest sounding name!). After first mistakenly attacking a British ship (amazingly and fortunately with defective magnetic torpedoes), they reloaded with older (but more reliable!) torpedoes and attacked the Bismarck. Additional British warship joined the fray, and by May 27 the Bismark was being attacked on all sides. A 16-inch shell from the Rodney struck top-side, killing several hundred men instantly and disabling the forward gun turrets. 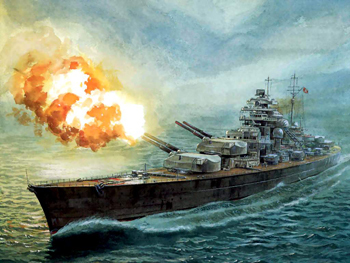 Despite massive shelling (more than 2,800 shells had been fired at the Bismarck, with over 400 hits! ), the British Fleet was unable to sink the Bismarck. The British commanders decided to finish the job using torpedoes, but at the same time, the Germans were scuttling the Bismarck by placing high explosives in the lower decks. Historians still debate whether the Bismarck was sank by British torpedoes/shells or by the scuttling action—though Robert Ballard’s own analysis indicates the scuttling is what likely caused the sinking (though everyone agrees it just accelerated the inevitable). 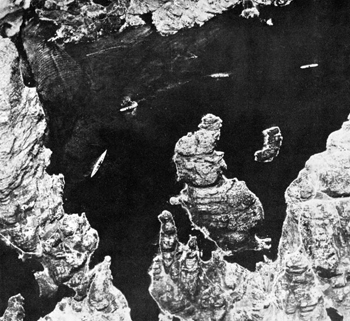 Ballard discovered the Bismarck 4 years after the Titanic, in 1989. The ship was found to be resting perfectly upright, having landed at the top of an underwater volcano (and subsequently sliding down about 2/3 of the way) at a depth of around 3 miles. Some large dents were found in the ship’s heavy armour, indicating that many of the round fired by the British Fleet simply bounced off the Bismarck. When a ship sinks, and if the hull has not been breached, it will typically implode at a certain depth (since the water pressure outside is far greater than the pressure inside). However, the Bismark’s hull was found perfectly intact, indicating that it must have flooded before sinking. This supports the theory that the scuttling action taken by the crew caused the immediate sinking of the ship.